An oft-maligned Italian wine, many producers are now making distinct, dry and crisp variations of Lambrusco that will fit any wine lover's taste. Seeking a dry, crisp and savory wine that pairs with just about any dish on the planet and makes an excellent apéritif? Look for Lambrusco. Yes, Lambrusco. Once known as the cheap, cheerful and fizzy plonk served with ice cubes, today’s top Lambruscos are a far cry from the industrially made, cloyingly sweet versions that flooded U.S. shelves in the 1970s and ’80s. Hailing from the Emilia-Romagna region, Lambrusco is made from its namesake red grape. Or, to be exact, the extended family of varieties grouped under the Lambrusco category. Once loved and then scorned for its candied sweetness, a number of producers now make distinct, slightly sparkling Lambruscos that belong on every wine lover’s radar. However, buyers beware—the styles vary tremendously and include lightweight, sweet and semisweet wines. The best Lambruscos are dry, crisp and delicious. Most are also extremely well priced. Here are the ones to seek. Lightly colored, fragrant and boasting vibrant acidity, Lambrusco di Sorbara, made from the grape of the same name, is the most refined wine of the Lambrusco category. Made around the village of Sorbara north of Modena, the variety excels in the sandy, fertile plains between the Secchia and Panaro rivers. Historically, Lambrusco di Sorbara was a dry, crisp wine that finished its fermentation in the bottle to produce a light effervescence. But large cellars then discovered the Charmat method, which is a much quicker and less labor-intensive process where the second fermentation occurs in steel tanks. It also allowed the flexibility to produce sweet wines. “The Charmat method generated a huge increase in production, but it also ended up destroying Lambrusco’s reputation,” says Alberto Paltrinieri, who runs his family’s winery, Cantina Paltrinieri. Founded in 1926 in the heart of Sorbara, the firm makes wines exclusively with estate grapes. “Charmat can give excellent results and control quality, or it can be used to make industrial beverages to suit market trends,” says Paltrinieri. Paltrinieri notes a number of producers have gone back to the traditional practice of carrying out the second fermentation in the bottle with no degorging, leaving a fine sediment at the bottom. This method produces dry, terroir-driven wines with personality. The wine’s rebirth began in the vineyard, where “greatly decreasing yields has been fundamental,” says Paltrinieri. Anselmo Chiarli agrees. He’s the managing director of Chiarli 1860, the oldest winery in the region, and Cleto Chiarli, the family’s winery dedicated solely to Lambrusco made with estate grapes. While lowered yields and optimal vineyard sites have aided the resurgence, Chiarli says that identification of the best clones has further enhanced quality. “In the 1980s, we began recovering the old clones in our vineyards,” he says. “After massal selection [where grafts are taken from existing old vines to propagate plantings, as opposed to planting new nursery vines], we planted the offspring of the best-performing vines.” These old clones give the wines more depth of flavor, which results in greater authenticity. The best Lambrusco di Sorbara examples are dry, with enticing scents of violet and crisp red-berry flavors. They’re silky, lightly sparkling and offer racy acidity. These are the most food-friendly Lambruscos, pairing beautifully with the region’s hearty cuisine, like cured meat or tortellini in brodo. Paltrinieri 2016 Radice (Lambrusco di Sorbara); $20, 93 points. Made entirely with Lambrusco Sorbara, this opens with enticing scents of citrus, woodland berry and wild flower. With secondary fermentation occurring in the bottle, the crisp, delicious palate doles out strawberry, pink grapefruit and a sprinkling of baking spice alongside racy acidity. The sediment at the bottom of the bottle gives the last glass even more flavor. Lyra Wines. Editors’ Choice. Cavicchioli 2016 Vigna del Cristo (Lambrusco di Sorbara); $18, 92 points. Fragrant and loaded with finesse, this boasts enticing scents of blue flower, wild berry and a whiff of cake spice. The fresh, elegant palate evokes strawberry, raspberry, candied nectarine and ginger alongside vibrant acidity. It finishes crisp and dry. Frederick Wildman & Sons Ltd.
Cleto Chiarli 2016 Vecchia Modena Premium (Lambrusco di Sorbara); $16, 91 points. Violet, wild rose and woodland berry aromas lead the nose on this lively, polished and joyful wine. The lightly sparkling palate doles out red cherry, crushed strawberry, candied tangerine zest and a hint of ginger. Crisp acidity gives it a clean, dry finish. Dalla Terra Winery Direct. Editors’ Choice. The polar opposite of Lambrusco di Sorbara, wines made with the thick-skinned, late-ripening Lambrusco Grasparossa grape are darkly hued and have more tannic structure than other Lambruscos. And while Lambrusco di Sorbara excels in sandy soils on the plains, Lambrusco Grasparossa needs clay and silt for optimum results. Grasparossa’s spiritual home is south of Modena, around the town of Castelvetro. Among the earthiest and fullest-bodied of all Lambruscos, Grasparossa di Castelvetro is the flagship wine for this variety. “Lambrusco Grasparossa di Castelvetro is actually more like a red wine, thanks to its body, tannins and structure,” says Fabio Altariva, who runs his family’s Fattoria Moretto winery, in the heart of the Castelvetro hills, along with his brother, Fausto. While other Lambrusco varieties grow in the plains, Lambrusco Grasparossa is the only one that does well on the hillsides, Altariva says, at around 650 feet above sea level, where it’s always breezy. Like other top producers, Fattoria Moretto keeps its yields far below the maximum allowed, and the brothers strongly believe that specific vineyard sites are a key for best results. In the past, Grasparossa bottlings tended to be more rustic, but most producers now seek to make increasingly elegant wines. In part, this is done by careful management of skin maceration to ensure they only extract the right amount of tannins. The best Lambrusco di Grasparossa Castelvetro bottlings are dry, dark and frothy. They offer dark berry and black-skinned fruit flavors, as well as a pleasantly bitter finish. Fattoria Moretto NV Monovitigno (Lambrusco Grasparossa di Castelvetro); $23, 91 points. Heady aromas of crushed grape and wild red berry segue over to the dry, slightly tannic palate alongside ripe blackberry, blueberry and savory hints of aromatic herbs. It’s frothy, vibrant and balanced, with firm acidity and a pleasant bitter note on the finish. Kermit Lynch Wine Merchant. Villa di Corlo NV Corleto (Lambrusco Grasparossa di Castelvetro); $24, 90 points. Alluring aromas of fragrant blue flower and plum lead the nose, while the smooth, vibrant palate delivers ripe blackberry and Marasca cherry. Bright acidity provides the framework. Ethica Wines. Zanasi NV Tradizione (Lambrusco Grasparossa di Castelvetro); $12, 89 points. Aromas of blue flowers and red berries lift out of the glass. On the savory palate, ground clove accents raspberry jam and wild cherry alongside refined tannins. Summit Selections. Best Buy. The most planted of the Lambrusco varieties, Lambrusco Salamino is often blended with other grapes to add its generous color and marked acidity without imparting strong flavors. It’s also commonly used to make off-dry and sweet wines. Lambrusco Salamino is planted extensively in the province of Modena, especially in the northern part of the province around the Santa Croce hamlet near Carpi, where it originated. While there’s a denomination devoted to the variety, Lambrusco Salamino di Santa Croce, most producers in the Modena province blend the grape into other Lambrusco bottlings. Lambrusco Salamino also plays an important role in Lambrusco di Sorbara production. The latter has a flowering anomaly that results in sterile pollen, so growers plant Salamino alongside to act as a pollinator. Up to 40-percent Lambrusco Salamino can be used in Lambrusco di Sorbara wines. Lambrusco Salamino is widely cultivated in the Reggio Emilia province, where it’s enjoyed excellent results. While the Santa Croce growing zone has fertile soils similar to those of Lambrusco di Sorbara, the plains near the foothills of Reggio Emilia contain more clay and rock. “Thanks to the soils, Lambrusco Salamino in this area produces richer wines, with more structure and tannins when compared to other areas,” says Alberto Medici, co-owner and part of the fourth generation of his family’s Medici Ermete winery, in the Reggio Emilia province. Fragrant and fresh, dry wines made with Lambrusco Salamino boast intense red-berry sensations and are well balanced. They’re somewhere between Lambrusco di Sorbara and Grasparossa bottlings. Medici Ermete has raised the bar for the variety. It plants at higher densities to yield more concentrated wines and pays careful attention to harvest times, among other factors. The brand’s Concerto bottling, first released in 1993 and made with 100-percent Lambrusco­ Salamino, is credited as the first single-­vineyard bottling of Lambrusco. Medici Ermete 2016 Lambrusco Concerto (Reggiano); $23, 90 points. Refreshing and racy, this frothy, focused red delivers aromas and flavors of raspberry, strawberry, orange zest, white pepper and a hint of dried black cherry. Made with 100% Lambrusco Salamino, it’s vibrant and delivers a crisp, dry finish. Kobrand. Paltrinieri 2016 Solco Frizzante Semisecco (Lambrusco dell’Emilia); $16, 87 points. 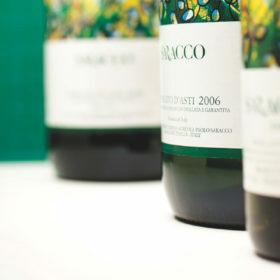 Made entirely from Salamino, this wine opens with scents of crushed grapes and raisins. The aromas carry over to the semisweet palate, along with a dried black-cherry note and hints of almond and ripe citrus peel. Vibrant acidity keeps it fresh. Lyra Wine. Cantina di Sorbara NV Dedicato ad Alfredo Molinari (Lambrusco Salamino di Santa Croce); $14, 86 points. Fun and refreshing, this deeply hued, informal wine has aromas of ripe red grape and a hint of raisin. The aromas follow through to the zesty, frothy palate, along with dried cherry and blackberry. It’s easy drinking and enjoyable, with a dry, tangy finish. USA Wine West. Besides the three DOC/DOP (Denomina­zione di Origine Controllata/Protetta) dedicated to Lambrusco (Lambrusco di Sorbara, Lambrusco Grasparossa di Castelvetro and Lambrusco Salamino di Santa Croce), the small province of Modena also makes Lambrusco di Modena. Part of the larger Modena denomination that covers the entire province, this designation is more flexible than the three flagship denominations. Lambrusco di Modena can be made with a blend of numerous Lambrusco varieties, and the maximum permitted grape yields are higher. Bordering with the Modena province, the province of Reggio Emilia also has a long Lambrusco tradition. Reggio Emilia doesn’t have any Lambrusco-only appellations, so Lambrusco plantings are destined to produce Lambrusco Reggiano, which falls under the larger Reggiano umbrella DOP. The appellation covers the entire province, and wines can be made from a blend of Lambrusco varieties. When compared to Lambrusco di Modena, maximum grape yields are lower. Even though more Lambrusco is planted in the Modena area, production of Reggiano Lambrusco is larger than Lambrusco di Modena. That’s because most Lambrusco plantings in the Modena province end up in the more celebrated Lambrusco-specific denominations. Given the large growing areas and more flexible grape blends, wine styles and quality vary tremendously, but there are some very good wines at great price points made under both designations. Cleto Chiarli NV Pruno Nero (Lambrusco di Modena); $16, 88 points. Inky purple, this delightfully rustic sparkler delivers prune, ripe blackberry and dried cherry alongside crisp acidity and small, continuous bubbles. It has a firm, dry finish and a lightly tannic grip. Dalla Terra Winery Direct. Medici Ermete NV Lambrusco I Quercioli Secco Lambrusco (Reggiano); $14, 87 points. Aromas of black-skinned fruit and violet lead the nose. The zesty palate doles out tangy mouthfuls of dried black cherry, prune and a hint of graphite set against brisk acidity. Kobrand. Rinaldini NV Lambrusco (Reggiano); $14, 87 points. Aromas of wild red berry follow over to the flavorsome, zesty palate, along with blackberry and a grapey note. Lively acidity and a salty sensation balance the fruity flavors. Pair this with hearty pasta dishes. Montcalm Wine Importers.